You’re here because you are interested in me and working with me. And I love you for it. But seriously, what can we do together? You want exposure (the good kind) for your company or brand, and I want to work with companies I admire and products I like and use. I also want the ability to go to blog conferences, to help support my family financially, and to gain experience in marketing and public relations. For a concise overview of my current and past work, visit my portfolio, Acute Genius. Angie has been around the internet and the business world for the last eleventeen hundred years (or so). With an online children’s store, a personal blog about nothing, an online magazine with like-minded real women, an Awesome site about Awesome, and a heavy hand at Twitter, she knows the internet and the world of social networking well. In addition to a full internet life, Angie has two young girls and a husband who puts up with a lot of her computer-driven life. She enjoys her TV and DVR more than what is considered healthy. She understands the happiness found in a good meal and isn’t afraid to take a second helping of everything good in life. I am a writer, a blogger, an entrepreneur, a mother, a wife, and a “retired” teacher. I do all of these things simultaneously with my wizardly powers, super-fast typing, and multi-tasking skills. I use social media on a daily (nay, hourly) basis to reach and interact with my friends, customers, and to the rest of my online community. All of my blog posts and Twitter conversations are personal and honest in their delivery. They can also be laced with sarcasm and snark (snarkasm), but they are always honest (and always Awesome). What do I contribute to the blogging and online community? Being a member of the blogging community for the last several years has provided me with the opportunity to meet other like-minded people. We support each other. We are friends, we create relationships, we listen to one another. In times of need, we rally together to support each other. I have been a part of several online fundraisers and awareness campaigns for fellow bloggers. In 2008, I organized Lotus HoF’oSho to help an online friend out of terrible living conditions. In 2009, I assisted in promoting Hope for Anissa after a friend and mother of 3 fell victim to multiple strokes. I have also participated in raising awareness for Friends of Maddie, a charity founded in honor of an online friend’s daughter who suddenly passed. For each of these, I have also utilized my online store newsletter and blog to raise awareness of these events and have contributed a portion of sales to these causes. 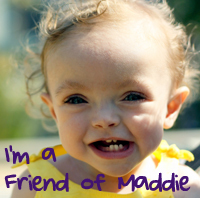 in 2010, I plan to give a portion of the shop sales in the month of April to Friends of Maddie to honor Maddie. I can provide exposure for your company. I can provide information about your products to key buying demographics. I can influence buyers in personal, face-to-face, unobtrusive conversations. Ideas for the terms of my ambassadorship include a sidebar ad for your company in my blog, inclusion of your brand’s logo on my conference business card, a to-be-determined number of blog posts dedicated to your company, and a giveaway of your product hosted on my blog. I believe in utilizing my ambassadorship in a natural, organic manner with my readers and fellow bloggers. I don’t believe in bombarding my friends and colleagues with my sponsor’s information. What have I done for other companies? As a blogger, I have attended several blogging events, including BlogHer ’11, BlogHer ’10, BlogHer ’09 and Type-A Mom in September 2009. While attending these conferences, I was tasked with being an “ambassador” for companies who wanted a presence both online and in person with other attendees. I have worked with brands directly and PR firms representing Nintendo, Eliza Parker, Wendy’s, Lane Bryant, Yummie Tummie, VTech, Tiny Prints, and Sorrelli jewelry to share information with other bloggers about their products face-to-face as well as on my blog. I was entrusted with the responsibility to conduct contests on behalf of the companies as well as use Twitter to communicate with my followers informing them of the brand message. In addition to being a Brand Ambassador for those companies at blog conferences, I have worked with the Old Navy and Pinkberry public relations groups to assist in expanding their reach in my local Orlando area as well as on my blog by hosting giveaways and in-person parties. For a detailed, linked list of most of the companies with which I’ve worked, click over to my About Me page. So, whom am I influencing? Attending blog conferences expands a brand’s presence in social media in a more personable fashion with influencers promoting the brand amongst like-minded consumers. Having me as an ambassador of your company will increase your exposure amongst women and mothers in key buying demographics. As an online store owner, I understand the products women are in search of and are purchasing for their children. I have worked in the online retail market since 2006 researching companies, learning buying patterns, and locating quality, safe products. I am the owner, manager, and all-around-everything for my online store, Good for the Kids. I “retired” from teaching and earning my Master’s degree after deciding to stay at home with my two little girls, then I began the store in 2006 when I couldn’t find a specific product I needed online. Since it began, the store has reached over 20,000 orders placed online from parents around the world. I am seeking full or partial sponsorships to attend any blogging and social media conferences. The focus of my attendance at the conference is the learn more in-depth ways to brand myself with my blog and to increase my exposure to other bloggers and brands. I am eager to work with any company or number of companies to achieve my goal of attending the conference in order to increase my reach through social media. In addition to conference attendance, I can help your online presence by promoting your event or product to my followers and readers. Please contact me to discuss in detail how we can work together. 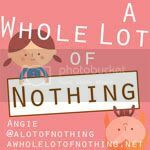 Please contact me at angie@awholelotofnothing.net to discuss our branding relationship. Or if you just want to tell me how Awesome I am.